You graduated from school years ago. But you’re still dealing with homework every night for hours on end, and it’s no fun. If your child refuses to bring work home, won’t do it at night or gives you endless grief when you try to help, Empowering Parents has some answers for you. Here, James Lehman explains how to get your child to do his homework so that you can stop the nightly tug of war and stop doing the work for him. Homework is often a barometer of what’s going on in the child’s life, and it’s easy for parents to misinterpret the issue. Sometimes the child can’t do the work because of a learning disability. Very often, the issue really isn’t the homework. The homework is what we call the “incident.” The issue is an unwillingness to do the work. If the homework struggles you experience are part of a pattern of acting out behavior, then the child is doing it to get power over you. His intention is to do what he wants to do, when he wants to do it, and homework just becomes another battlefield. And, as on any other battlefield, parents can use tactics that succeed or tactics that fail. It’s easy for parents to get into power struggles over homework. They’re concerned about their kids performing and getting a good education. Meanwhile, they work like dogs all day providing for the family. When they get home at night, they have to set up the evening, make dinner, do laundry, and help the kids with homework. The last thing they want to do is fight with their kids over it. So what tends to happen is parents take shortcuts, and it’s a trap they fall into. One shortcut can be doing the homework for the child. Parents do this especially with school projects. Another shortcut can also be yelling and fighting and screaming rather than putting an effective plan in place to get the work done. A shortcut can be bribing the child to do the work instead of rewarding him for doing it. We’ll talk more about that in a minute. So how do you stop the battle and get your kids to do their homework? 1. Talk to your child’s teachers on a weekly basis. When you’re dealing with a child who has problems doing homework, you have to communicate with teachers weekly and on a detailed level. If it’s important to you that your child succeeds, then you have to work closely with the school. Because all you have otherwise is the kid’s word for it. Make sure that the amount of homework is appropriate for your child’s learning ability and style. Go to school conferences. Know what’s being assigned and how much. My son had ADD. I used to make him do all the homework, and it would take him longer, and it was difficult for him. Making him do the entire assignment was the theory base at the time. Then a new theory base came along that focused on getting kids to do what they can accomplish well in that time. If it takes the child the entire time to do two problems because he has ADD, and other kids can do all the problems, then that’s what he can do. He’ll learn just as much. Parents have to know what their kids are capable of. Don’t ask the teacher to give less than what’s necessary to learn the subject. But know if your child has some learning deficit, and talk to teachers about it. Communicate with the school to determine what homework has been done and what hasn’t been done for the week. If your child has a chronic problem with homework, set up a system where, every Friday, the teacher informs you about what homework is owed for that week. Specifically, what pages in what books. Then, your child’s weekend should not start until that homework is done. If Friday comes along and it turns out that he has two more hours of homework to do, then he doesn’t get to start playing video games, get computer time or go out that night until that week’s homework is done. 2. Reward performance consistently. Every Friday that you get a note from the teacher saying that your child has done all the homework assigned for the week, your child gets a star or a check mark or a point. After so many stars, he gets a treat or reward, such as an activity he likes. It doesn’t have to be something that costs money. It can be going to the beach or the park with the parent or spending some time with the parent individually. If you’re setting up a system with a younger child, a reward can be that you take half an hour to sit down and play some games with your child that he likes. Have a menu of rewards that your child will enjoy. Sit down and write up the menu with him. Don’t associate it with homework or anything else. Just find out what he likes to do. Your kid will probably say something like go to a concert or a sports event. Don’t discourage those things. Say, “Okay, that’s interesting.” Then keep going until you get a list of realistic things that your child will enjoy and work toward. Remember earlier I said that one of the shortcuts we take as parents is bribing our kids rather than rewarding them for performance. It’s a subtle difference. A reward is something that has performance programmed into it. A bribe is something you give your child after negotiating with him over something that is already a responsibility. For instance, if my son got B’s or above, he got a certain reward, which was linked to what we could afford. It was a reward for his performance. A bribe is this: “If you do this tonight, I’ll do this for you on Saturday.” It changes the balance of power. In a reward program, the parent has the power. When you’re rewarding performance with stars or checks, and the child is completing the work and earning an activity or thing he likes, you have the power. If you’re bribing your child to do his homework, the kid has the power. 3. Withhold activities consistently, especially with older kids. Reward adolescents and teenagers with things that older kids like to do: going to the mall unsupervised, spending time on the phone, having a phone, spending time on the computer, having a computer in their room, going to parties, dances and sports activities. Withhold the things that are important to them if the work doesn’t get done. If the kid’s homework isn’t finished by Friday afternoon, the weekend doesn’t start until the homework is done. Don’t give in to, “Oh, there’s a football game, and they’re depending on me.” Too bad. If you can hold true to this rule once, and deal with the behavior, next week the homework will be done. 4. Have your child maintain a homework log. Monitor and maintain it throughout the week with the child. Check off what gets done, and let him know that if he’s dishonest, you’ll be talking with the teacher, and he’ll just have to make it up on Friday and delay his weekend if he doesn’t do it. 5. Don’t let kids do homework on the computer in their room if you can avoid it. Have them use the family computer if possible. If they do it in their room, the door to the room should be open, and you should check in from time to time. No text messaging, no fooling around. Take the phone away. It doesn’t matter who bought it, who owns it, etc. It’s in your house. Use of it should be controlled by you. 6. Use hurdle help, as described in The Total Transformation Program. Help them when they’re stuck. Help them come up with ideas. It’s okay to brainstorm with your child as long as he’s doing the work. Do not do the work for your child. The work is his responsibility. Not yours. 7. Stay the course. You’ve got to hold true to what you decide. Expect the child to resist and act out. But stick with it regardless. After he misses one or two football games, trips to the mall or nights out, he’ll decide it isn’t worth it, and he’ll do the work. Know what’s important to your child, and use the ability to have and use those things as a reward for getting work done. 8. Be prepared to let the child fail. Then manage their life around failure. Example: “If you get a D, your phone will be taken away until you bring it up to a B.” Communicate with the teacher. Don’t give the phone back until the grade is back up to a B. Don’t get stuck in the trap of, “But my son bought the phone, therefore he has a right to it.” He doesn’t. The right to use it is earned. Put this plan in place with your child at a time when things are calm and going well. Not in the heat of an argument. Tell your child that you’re going to try something different this year with homework that will make it go better for everyone, then explain the system. You’ll find that adding this little bit of structure at home will do three things: 1.) make your life easier as a parent, 2.) make you more effective as a parent, and 3.) help your child to get the work done. 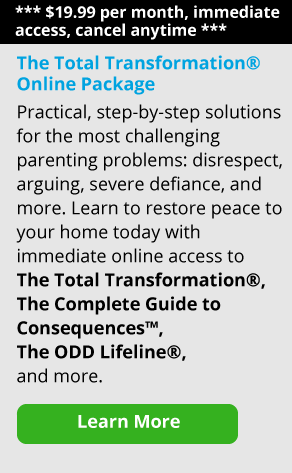 James Lehman, who dedicated his life to behaviorally troubled youth, created The Total Transformation® Program, The Complete Guide to Consequences™, Getting Through To Your Child™, and Two Parents One Plan™, from a place of professional and personal experience. Having had severe behavioral problems himself as a child, he was inspired to focus on behavioral management professionally. Together with his wife, Janet Lehman, he developed an approach to managing children and teens that challenges them to solve their own problems without hiding behind disrespectful, obnoxious or abusive behavior. Empowering Parents now brings this insightful and impactful program directly to homes around the globe. 4. Are You Doing Too Much for Your Child?